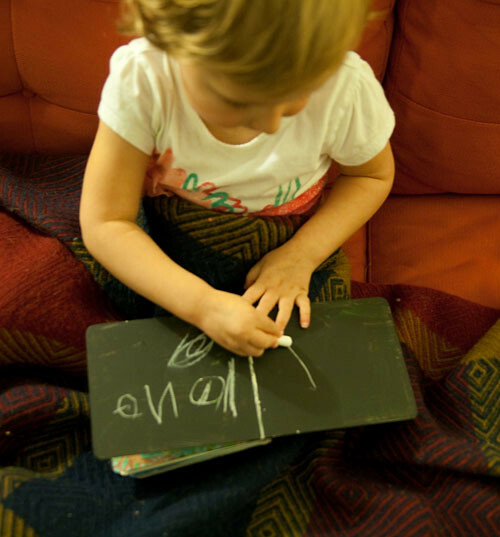 Back in August we shared some ideas for using chalkboard paint in your home. 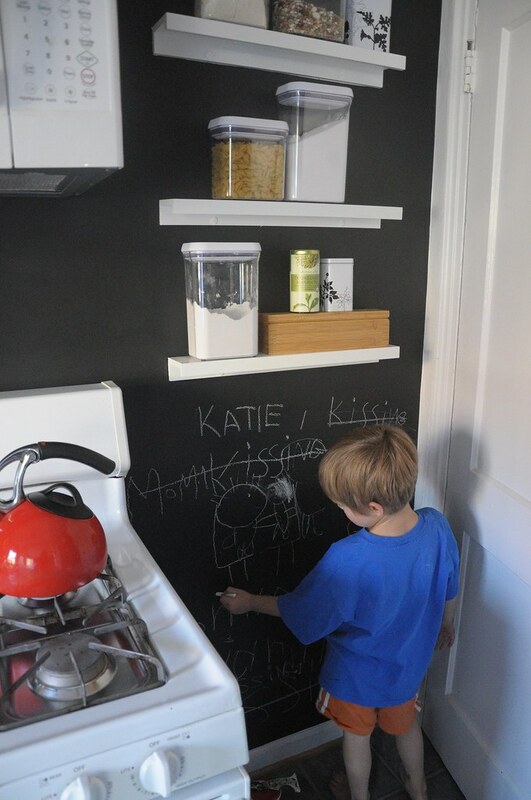 Well, we’re back with more ideas — chalkboard paint is so versatile and so fun! I love chalkboard paint so much I used it as my kitchen backsplash. I was afraid it would make the small kitchen look even smaller and darker, but so far it hasn’t. 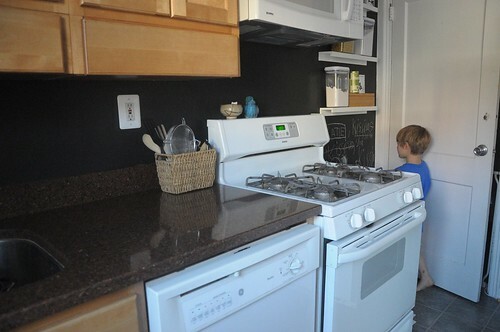 In the corner by the stove there is an entire wall for the kids to doodle. (Don’t worry, the kids aren’t allowed back there while the stove or oven are in use.) And if I’m cooking and I need to leave myself a note, I can just write it on the wall — comes in handy when you are inventing a new recipe. One tip: Let the first coat dry completely before applying the second coat otherwise the first coat rubs off. You’ll need 1-3 coats, but each coat dries pretty quickly. We mentioned these gift tags in our last post and I’ve been itching to make them ever since. I bought the tags at Michael’s for about a quarter a piece. 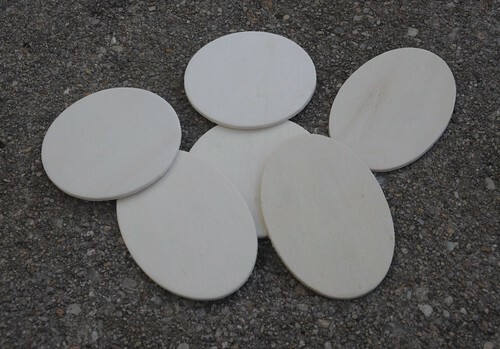 They come in a variety of shapes — round, oval, square, heart, even seasonal shapes like angels and trees. You have to drill a hole in them (make sure to do this before you paint) and add a ribbon or string. The best part is your gift recipient can use them again for another occasion — just wipe clean with a damp towel. 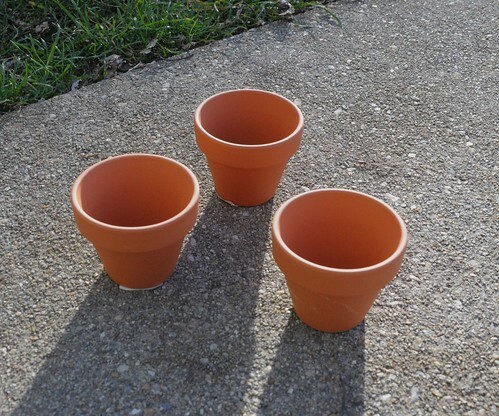 Painted terra cotta pots are one of my new favorite projects. 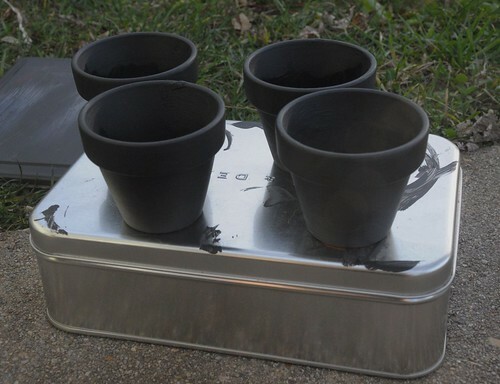 Here are the pots pre-paint, while drying, and then filled with all sorts of goodies. They can be used as a centerpiece on a table, placecards at a meal, goodie bags for a party, or just as decorative accents throughout the house. 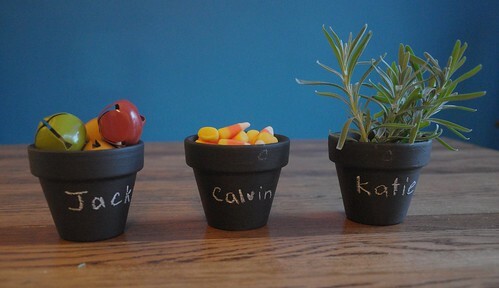 Here I’ve filled them with jingle bells, candy corn, and fresh herbs from the garden. 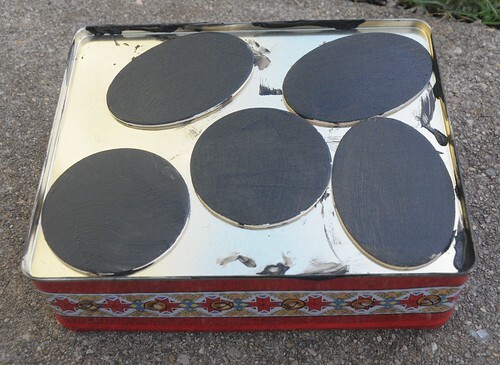 I found a bunch of old tins on the side of the road and decided to spray paint the bottom of this cookie tin red and then use chalkboard paint on top. It used to be one of those blue Danish butter cookie tins. 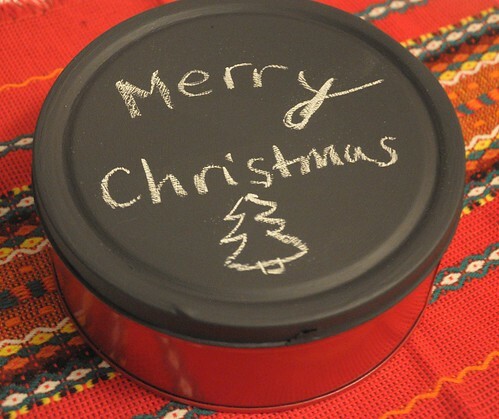 This will work for any gift giving occasion — just write the message or contents on top. 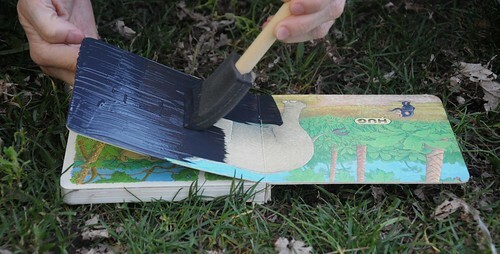 Leslie took an old board book her daughter outgrew and covered it with chalkboard paint. Her little girl can now use the book to write her own stories and draw pictures. 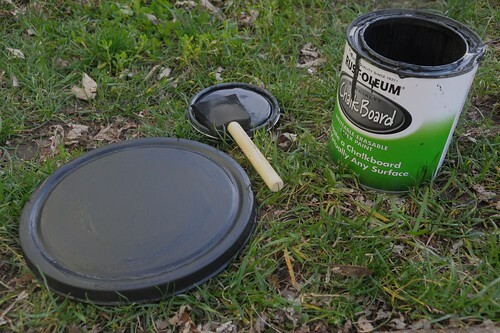 Have you used chalkboard paint? Tell us how you’re using it. We used it to paint a chalkboard on the wall and then found an old distressed frame to frame it. Turned out better than I expected! We’d love to see a photo of this! would chalk board paint still work??? I’m a little confused — do you have wallpaper or textured walls? My walls aren’t completely smooth and it works fine. But if you are talking about painting over wallpaper, you might want to consult your local paint store. I know people who have painted over wallpaper without any problems, but not sure what type of priming they had to do. Good luck and let us know how it turns out! In my kitchen the backsplash is just the wall and they have a slight texture to them. I was wondering do I have to make them smooth or will the chalkboard paint slightly smooth them out. My husband was thinking we would have to put a smooth board on the backsplash and then paint it with chalkboard paint to have a smooth surface. Hi Shannon — I don’t think the paint will smooth out the walls, but my walls aren’t totally smooth and the chalkboard paint worked just fine. You could test out a spot and see if you are ok with the texture before going through the trouble of installing the boards. Thanx!!!! Im going to do that after work!!!! Oh…should I coat it with a charcole gray primer so I don’t have put alot of coats of the chalkboard paint? No, you’ll want at least 2 coats of the chalkboard paint to get the whole chalkboard effect, so priming probably won’t make a difference. It goes on pretty thick, just let it dry between coats. Let us know how it goes! I love my chalkboard backsplash. Im about to paint my backsplash tonight…Im so excited…another question…after 3 days do we have to season the chalkboard with chalk before writing on it…just rub the chalk all over the chalkboard? I just don’t want to write on it and then when I erase the board the writing wont come off…which I had bought my little cousin a chalkboard from Ikea and it is so hard to erase and when we do erase the writing is still ont here…any tips on that….I think some said to sand down the chalkboard from Ikea then it should be fine. I’ve heard about seasoning the chalkboard wall. I didn’t do this, but probably should have. I don’t have trouble erasing and for tricky spots a damp towel works fine. Cool…Thanx!!!! I will let you know how it turns out!!! Can I use Chalkboard on a texture wall ? i’m afraid i could’t paint on it, if you already had painted your texture walls tell me please if it works/or not..